We got amazing feedback from our group that attended the tour with Matijas. Very knowledgeable and clear. Will use again! This was a comprehensive and thoroughly enjoyable tour with Matijas. We stayed in Rovinj for the 2 nights of the tour and covered first the southern then the central areas of the peninsula and on the last day drove via Grojnan Motuvun and Hum back to Zagreb. Matijas is passionate and his knowledge of the history of the area is vast. The Istrian peninsula is fascinating and very beautiful. We loved it and would not hesitate to recommend Matijas and Tours by Locals. Matijas, was highly informative. He tailored the tour to our interests and introduced us to sights and history that we would never have seen/learned without his insights. A great day ! 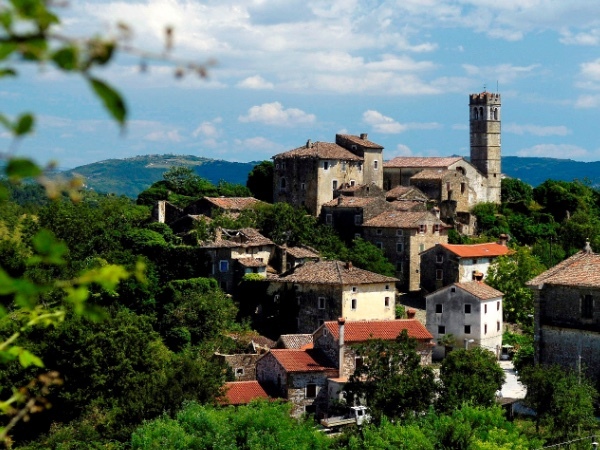 Comprehensive knowledge of Istrian history and culture. A very efficient tour of two spectacular hill towns and a lovely winery and olive oil producer. Delicious, truffle-filled lunch. We had two teenage boys with us and they thought Matijas was great too. Would not change a thing! Matt was amazing. He pulled together a custom 2 day winery tour with less than one week's notice, no easy feat in Istria in August. Besides the itinerary he gave us a very informative and entertaining commentary on Istrian culture, history, and wine. Highly recommend. We spent half a day in Pula with Mat. He showed us Pula Arena (there is only one Colosseum and it is in Rome) to be a living and breathing Roman amphitheater that still is a venue for many cultural events in Croatia. Tour of catacombs under the Arena was equally interesting and informative. Mat's tour included several parts of this historical city and highlighted the connection to the modern day. We would recommend Mat to anyone looking to tour Pula and learn about its past and present. Matijas was a terrific guide and we had a very enjoyable morning in Pula. Matijas picked us up in Slovenia and showed us his hometown of Rovinj. We then moved onto Porec. He was extremely knowledgeable about the entire area. Also, he adjusted the schedule to fit our needs. It was a great tour! Our two day istria tour with Matijas was wonderful. He accommodated all our requests and was a wealth of information. He was flexible with the planning including a hike for us and lunch at a restaurant recommended by a friend. He was friendly and had a nice way about himself. Highly recommended! Matijas is tremendously knowledgeable on all aspects of Pula and Istrian peninsula sights and history. He ensured we saw the key sights of Pula and avoided crowds and other tours so he could best converse with us while still see the highlights. This was my third guided tour of Pula and his was by far the best. He encouraged our questions. He gave us the opportunity to tailor the selection of sights. As we finished the tour, he gave recommendations for local restaurants and other Pula towns to see. Matijas is an exceptional guide. Not only did he accept my booking on the day of but he showed me everything there was to see. His explanations were descriptive and interesting. He made sure that everything was to my liking. He even took the time to find out about my interests so that he could cater the tour to my preferences. Absolutely fabulous experience! TOUR GUIDE RESPONSE: Thank you, I am very glad you have enjoyed the tour! All the best and have a great time! Matt was a fantastic tour guide! Our group of 8 people thoroughly enjoyed our walking tour in beautiful Rovinj! Matt helped us with shopping and dining recommendations and even made dinner reservations for us at Puntulina, our favorite restaurant we experienced during our 10 day European tour. Thank you Matt!!! Matijas was an excellent guide, providing a tailored itinerary and taking us to a mix of wineries and other areas we wanted to see. He was very knowledgable on the area and its history. I would highly recommend him for a driving tour or any sort of tour, whether it is a small group or a large group. We enjoyed our tour with Matijas and felt we got more out of Pula on his guided tour than just wondering about on our own. Our thanks go to Matijas for a great tour. Well done and highly recommended! Matijas did a superb job for my group of 10. He has so much insider's knowledge since he is from Rovinj. He helped me with the additional aspects of our visit in Rovinj. He not only suggested a restaurant for us in Rovinj, but contacted the owners on my behalf to make a reservation, explore options for set menu, etc. Same for our dinner and wine tasting in Bale. He found an option to rent an accordion for one of my guests. No request was too big, we really enjoyed meeting him and highly recommend him. Love Rovinji. And Matijas Gave us the tour on the Croatian tuscany. Beautiful places, the views where amazing. Matijas was very helpful When we lost our ferry to Venice. Good tour. Matijas was very knowledgeable. Took us to a great little place for lunch with the "locals" that we really enjoyed. When one in our party got sick mid-morning, he arranged for alternative transportation back to ship while rest of us continued. Pretty area. Pleasant day. BTW, this review is for tour that took place in August '16. This was an awesome trip as our guide Matijas was very knowledgeable and fun. He took us to some great sites, gave us plenty of education and made sure we were fed well. I can definitely say that by traveling with Matijas that after 8 hours we all felt like locals!!! Very knowledgeable and interesting. Recommended some restaurants to go to. "Mat" was a force of nature! His love of his home and country was evident in every aspect of the tour. We took a 9 hr tour of the Istrian peninsula of Croatia. I now know the entire history of that area going back to the bronze age! Gorgeous country! To say that he was enthusiastic was an understatement. Highly recommended! I asked for scenery, history, culture, food and wine -- and I got all that and more. Matijas was prompt, interesting, well-informed and very kind. A great spokesperson for his Istrian territory. Our full-day Food & Wine Tour with Matijas was the probably the highlight of our 10-day trip to Croatia. Matijas created a tour that incorporated all our interests (food and more food), plus more (walks through the hilltop towns,achitecture, gorgeous scenery). We spent close to 10 hours with him but the hours simply flew by because we were having so much fun. You can instantly feel Matijas' passion for Istria and we are very grateful that he shared with us al the my reasons to love Istria. Priceless! We had two tours with Matijas and both were very nice. Quite informative and he really knew his history! This is another guide we highly recommend. EXCELLENT! Matijas have great history and background on the towns that we visited, as well as sites along the way wow driving. Really fantastic tour. We learned much about Istria's history, and got to see some incredibly beautiful scenery. We are so happy we hired Matt for a tour of Istria. Although we booked him at the last minute, he was super professional and organized. He is passionate about the area and had a nice sense of humor. I would highly recommend him to others. Marijas is extremely professional and knowledgeable in all areas. His customer focus ensures that you are enjoying the time. Although he is very serious regarding his profession, his sense of humor and story telling enriches the exchange. He is able to gauge your interests, is flexible, and steady in character. Whatever your personal interests is, he ensures your goals are met. Because of him, I fell in love with Istria. If you book a tour with him, you are sure to have a wonderful experience. Matt was very helpful right from the time we first contacted him by e-mail. He provided options for meeting him, sent detailed directions, and even changed the date of our tour when we requested it. As a guide, he is both friendly and knowledgeable, and was very good about adjusting the tour based on our interests and capabilities. In just 3 hours, we were able to learn about Pula's rich history, as well as understand much more about the Istrian Peninsula and its people. Well worth the money! Matt made it easy for us to enjoy the hilltowns as he drove the side roads we would not have known. His descrption of the countryside was so interesting. He knew the best place to go for a wonderful local lunch. I loved having the personal attention of a private tour with Matt. He offered us additional information about Croatia to make our trip even better. Thanks Matt. Matt's experience and knowledge of Rovinj made this a great tour. It truly was a tour with a local as we passed many people he knew. His description of the town and its history were very informative. He was very willing to help us with any questions we had. As it turned out we loved Rovinj enough to stay longer, which pleased Matt. He was very helpful to us with arranging for travel out of Rovinj also. We could not have done this without his help. Thank you!! Matt is a fabulous tour guide and very knowledgable about the area of Istria. He grew up in Rovinj and still lives in the Old City area. He specializes in custom tours. Tell him what you want - he will make it happen. He did for us and it was fantastic! Carlisle and Chris Albertson U.S.A. This was a very informative tour. Matijas was very helpful to us. We would highly recommend him. Kept the tour interesting and informative. Very knowledgeable. Matijas is a wonderful tour guide! He was very flexible and accomodating to our wishes. When he found out that I love truffles, he took us to a local festival where I was able to see the coveted white truffles and we were able to taste many locally made foods and wines. We visited several very beautiful, small villages and also had a delicious lunch at a restaurant that Matijas had arranged for us. Matijas is very knowledgeable about the area and his english is excellent! Highly recommended!! Excellent guide for the Basilica. Went above and beyond to be helpful. Spoke English well. Friendly. TOUR GUIDE RESPONSE: thx :) it was great for me to have such great guests, all the best! We enjoyed all of Pula with Matt. He gave excellent history and descriptions of ruins and monuments. We enjoyed his tour very much. Matijas is a well seasoned, knowledgable guide and we spent a wonderful day with him touring the hill towns of Istria. We were so glad to take this tour - we were on a cruise and dislike the large, crowded excursions offered by the ship - this tour got us into the countryside of Croatia. The hilltop towns were quiet, with few tourists and breathtakingly beautiful. We sampled local foods, olive oil and wine and wandered through charming villages. Matijas will adapt the tour to meet your personal needs. very informative Matijas was very knowlegable able to answer all our questions about Pula. good pace for walking tour, saw a number of things off the regular streets which you would not know about. Would look for Matijas if in the area again.